SPEEDLINER® 1000 owners enjoy having a protective coating that provides years and years of maximum performance, even under the toughest conditions. It all starts with a professional installation. Here are the steps we take to ensure your liner provides maximum protection! The entire vehicle is protectively masked off. 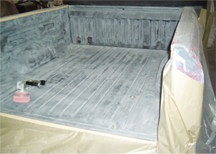 Then the painted surface of the truck bed floor, walls and tailgate are sanded to increase adhesion. A special chemical product is used to further strip away any grease, wax or gloss that might remain. An adhesion promoter (primer) is applied. This further ensures that the surface will now be ready to permanently bond with the SPEEDLINER® material. The spray process is followed by a cure period, which allows SPEEDLINER®'s special chemistry to fully bond. This process works just like an epoxy material, becoming stronger and stronger as the curing occurs. 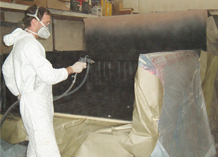 The final step in the SPEEDLINER® job is the removal of masking materials. That's it! This truck looks great with its new SPEEDLINER® protective coating in place, and so will yours! Copyright © 2013 Finishing Touch Car & Truck Inc. All Rights Reserved.